A compact tourist guide for Lithuania travelers. Recommendations and local tips for the activities, cuisine, what to buy and the accommodation options. 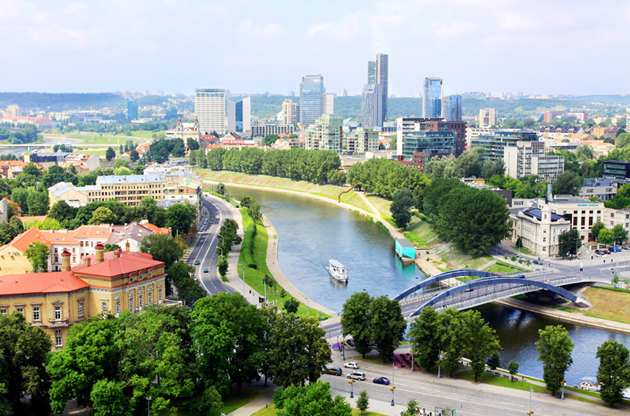 Lithuania is a small Northern European country and (sometimes referred as Eastern-European) the largest of the three Baltic States. It has around 3 million inhabitants. Lithuanian language is not only the oldest one from the Indo-European family of languages, but also one of the two worldwide that has retained its original authenticity. Lithuania is not for someone who is looking for year-round sun or palm trees and bananas. The name “Lietuva” (Lithuania) itself is derived from the word “lietus” which means rain. Yes, it does rain a lot, but otherwise could not be so green and the capital, Vilnius, would not have been named the greenest capital in Europe. Whenever you are flying to Lithuania, as soon as you land in the country and get off the plane, stop for a second and take a deep breath. You will quickly realize the air there is incomparable with that in Spain, Italy or France. Is it better? You decide. Lithuania is also not for mountains lovers. 75 per cent of the Lithuania’s surface is completely flat. However, that does not mean it has nothing to compete with Alps or Tatras. Flora and fauna is different, but not less majestic. There are hundreds of beautiful lakes and rivers, stunning pines and fields. On the topic of heavy rainfalls, normally you will not encounter storms in the summer. The average temperature in this period of a year reaches 23 degrees so make sure you bring your swimsuit and some sunscreen with you. Winters are not as harsh as those in Russia, but a fur coat and gloves are something you will not regret taking with you. It is situated along the South Eastern shore of the Baltic Sea, to the east of Sweden and Denmark. It borders Latvia, Belarus, Poland and Kaliningrad Oblast (a Russian exclave). There are 82 countries from which the citizens are not required to have visas to travel to and from Lithuania. To find more precise information, please, visit the official website of Lithuania Ministry of Foreign Affairs . It was the capital of ancient Lithuania. The main sight there is a Castle built on a peninsula and washed by waters of three lakes. In the 15th century it was one of the main centres of the Grand Duchy of Lithuania and had significant strategic importance. Your journey will be even more unforgettable if you book a yacht trip on one of the numerous lakes. Do not forget to try the traditional dish of Trakai – kybyn (a pasty stuffed with minced meat). Locals from Vilnius, Kaunas and other towns love coming here just for that purpose – Trakai’s kybyns are indisputably the most delicious dishes in Lithuania. Kernave’s hill forts are absolutely unique in the entire Baltic Sea region. There are five of them in just one spot. Here you can also view the ancient artefacts at Kernave’s Archaeology and History Museum. Druskininkai is a year-round resort which offers mineral baths, mud and climate therapies. Amazing sanatoriums, spa centres, beauty salons and the biggest water park in the Baltics welcome everyone who is seeking refuge from hectic life. Many tourists from Poland, Belorussia and other countries appreciate the service they get there and often come back. For large shopping malls, AKROPOLIS is the most popular and it be found in the biggest cities: Vilnius, Kaunas, Klaipeda and Panevezys. Gucci, Guess, Nike, Puma and other global brand items are sold there. If you ask a waiter to recommend you something from the national cuisine, you will be given the following options: cepelinai - potato dumplings stuffed with meat, kugelis - potato pudding, vedarai - potato sausages, bulviniai blynai – potato pancakes. Too much potato perhaps? There is no need to panic – not all of the dishes are made entirely of potatoes. Lithuanian cuisine also includes zrazai - fried beef stuffed with salt pork, crushed garlic and caraway seeds as well as Lithuanian goulash. In summer, Lithuanians prefer not to burden their bodies with heavy food, so they take šaltibaršciai - a light cold beet soup instead. If you are unsure what drink to get, ask for a cup of locally brewed gira – kvass. Lithuanians just love it. Fortunately, the number of crimes committed against tourists is very small. Nevertheless, you should stay cautious with your belongings, especially when on buses and major attractions. Pickpockets do exist and they never take holidays. If you want to avoid an embarrassing situation, you’d better shake hands with both men and women while greeting rather than give a kiss on both cheeks. Lithuanians are not French – they kiss only when they mean it. Business and academic events in Lithuania draws worldwide attention to the country since all of them turn out to be perfect organizations. High end venues with the latest technology and broad spaces, rich cultural heritage, limitless social activities and the favorable climate play the biggest role in making Lithuania for a matchless host country for the global gatherings like conferences, congresses, trade shows, symposiums, fairs and exhibitions.